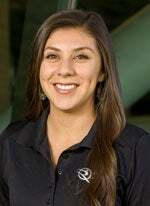 Isabel Ayala was born and raised in Oxnard, California, where she spent her youth enjoying the benefits of recreational sports like soccer and swimming. She graduated with her Bachelor of Science degree in Management and a minor in Finance from CSUN in 2016. During her undergraduate experience at CSUN, she was able to display her leadership potential and find her passion for assisting others in her roles as a New Student Orientation Leader, Volunteer Income Tax Assistance (VITA) Preparer and Camp Matador Counselor. While being a dedicated CSUN student and contributing to her community, Isabel began her employment with the USU in 2014. Hired initially as a Student Operations Services Assistant within the Facility Operations Department at the SRC, she was promoted to the Student Building Manager position. Isabel currently serves as the Fitness Supervisor within the Fitness & Wellness Department and she strives to encompass physical and mental wellness into her everyday work and personal life. In her spare time, Isabel enjoys exploring Los Angeles, attending concerts and sporting events and spending time with family. Amanda Frick was born and raised in a small town in the Antelope Valley. As an active child who spent most of her time after school at her aunt’s fitness facility, Amanda developed a love for fitness and wellness early in life. This love eventually grew into a desire to pursue a professional career path in fitness and wellness. 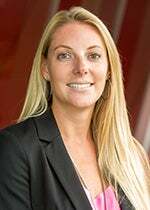 When Amanda began working as the fitness programs coordinator for Associated Students Recreational Sports division in 2008, she found her true calling. In 2011, Amanda had an opportunity to be a part of the inaugural staff for the Student Recreation Center as a graduate assistant for the Fitness & Wellness department. After completing two years in her assistantship, Amanda was promoted to her current position as the fitness coordinator. 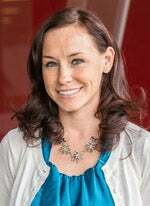 Amanda has been a certified personal trainer for seven years and holds a certification with the National Strength and Conditioning Association (NSCA). Additionally, she has instructed group exercise classes for six years and is certified with the Aerobics and Fitness Association of America (AFAA), and trained as a group exercise instructor in Krankcycle®, Spinning®, TRX® Group Suspension Training, FitWall®, Peak Pilates® MVe Chair, Turbo Kickboxing® and Schwinn®. Amanda’s goal in life is to encourage others to live a healthier lifestyle by practicing what she preaches. Her motto is, “Take everything in moderation and you will live, love, and laugh for a lifetime.” In her free time, she enjoys exercising in a variety of modes both indoors and outdoors, along with expressing herself through art by painting and drawing. Most of all, she enjoys spending time with close family and friends. Ryan Hairapetian grew up in Glendale, California. Early on he was involved in multiple sports, such as gymnastics, martial arts, water polo, swimming, running, and snowboarding. In high school, Ryan was the captain of his water polo and swim team for Hoover High School. Showing a high level of passion for aquatics, Ryan decided to become a lifeguard for the City of Glendale. 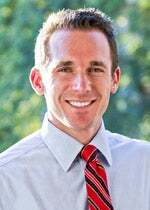 While developing his love for recreational sports, Ryan pursued his Bachelor of Science in Tourism, Hospitality, and Recreation Management at California State University, Northridge. 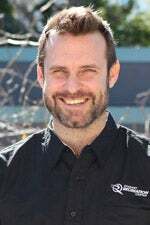 Throughout his professional life, Ryan has received multiple certifications that have allowed him to excel within his career. He has completed his Emergency Medical Technician course, expanding his knowledge as a first responder. 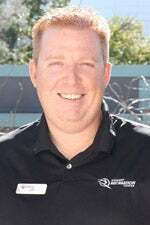 Ryan welcomed the opportunity to oversee the Aquatics Department as the Aquatics Coordinator for the Student Recreation Center at CSUN. 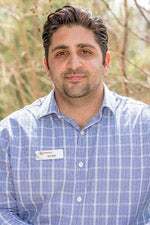 Ryan and his wife Jasmine live in Sunland, California and enjoy spending time with family and friends. They also enjoy hanging out at the beach, going for walks, and, most of all, having sushi. Alfredo Padilla was born and raised in Michoacán, Mexico before his family moved to Santa Ana, California when he was 12 years old. After graduating high school, he developed a passion for fitness working at a Central Santa Ana community center coordinating their health and fitness programs. 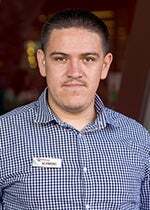 Alfredo eventually transferred to California State University, Northridge (CSUN) from Orange Coast College in 2014. When he saw the Student Recreation Center (SRC), he made it his personal goal to work there. In May 2015 he was hired as a Student Personal Trainer. Just a year later he became the Student Personal Training Supervisor and eventually earned his current position of Fitness Training Coordinator. 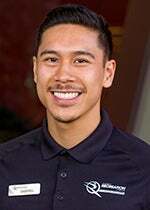 Alfredo received his Bachelor of Science degree in Kinesiology with an emphasis in Applied Fitness and Active Lifestyle Development from CSUN. He holds credentials with the National Academy of Sports Academy (NASM), Functional Movement Screening® Level 1 Certified, and Spinning®. Alfredo enjoys long distance running, surfing, biking and occasionally takes road trips with friends. His personal goal is to motivate others to be active and live a healthy lifestyle. Gabriel Rosales was born in the San Fernando Valley and raised in Palmdale. Ever since he was a child, sports and fitness have always been central to his lifestyle. As an undergraduate at CSUN, Gabriel sought out to be more involved around campus and began his employment with the University Student Union in 2015. Starting off as Building Manager with the Facility Operations Department at the Student Recreation Center, he eventually moved up to the Operations Assistant. After graduating with a Bachelor of Science degree in Business Information Systems in 2017, Gabriel seized the opportunity to serve as the Facility Operations Coordinator for the SRC. His goal is to help students who work at the USU to develop as young professionals and gain the necessary skills to excel in their future careers. With his desire to continually grow, it's not uncommon to find him spending his time training in the weight room, running around on the basketball courts or relaxing with a good book in his hand. Briell Huerta was born and raised in Culver City, California. At a very young age, she found her love for aquatics. By the age of six, she started her journey through a variety of aquatic sports. Her passion began as a synchronized swimmer and later took her into water polo, diving, synchronized diving, swim team and junior lifeguards. At 15, she became a lifeguard and swim instructor at her local pool and did not stop there. Currently, she attends California State University, Northridge as an undergrad pursuing a Bachelor of Arts in Psychology. During the fall of 2014, she became a lifeguard at the Student Recreation Center at CSUN. After acquiring her Water Safety Instructor and Lifeguard Instructor certifications through the SRC, she has gone on to teach swim lessons and CPR/Lifeguarding certification classes. Briell enjoys the outdoors and is on a mission to explore as many National Parks as she can. During her free time, she takes trips to Disneyland and enjoys time with her family and friends. 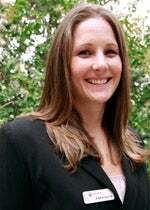 She currently serves as the Aquatics Supervisor and is in charge of the American Red Cross courses offered at the SRC.